Back in early August, 12 ears of the On Deck hybrid were harvested from the 18 tall and proud stalks. Not all 12 were edible, others yielded just a few rows of snaggle-toothed kernels, but a few were perfect little cobs of sweet corn. All told, the palm-sized hybrid cobs yielded just enough corn to augment a tasty batch of guacamole. Not necessarily a horticultural miracle, no, but they were awfully fun to watch and it’s pretty gratifying to have some knee-high by the Fourth of July action going on in an urban container garden. All of this is to say: POD had three (aphids had totally claimed the honey bun melon) large pots ready for the taking. As this is real estate that would have in prior years was occupied by tomatoes and disappointing green beans, it was like having a blank canvas upon which to plant! 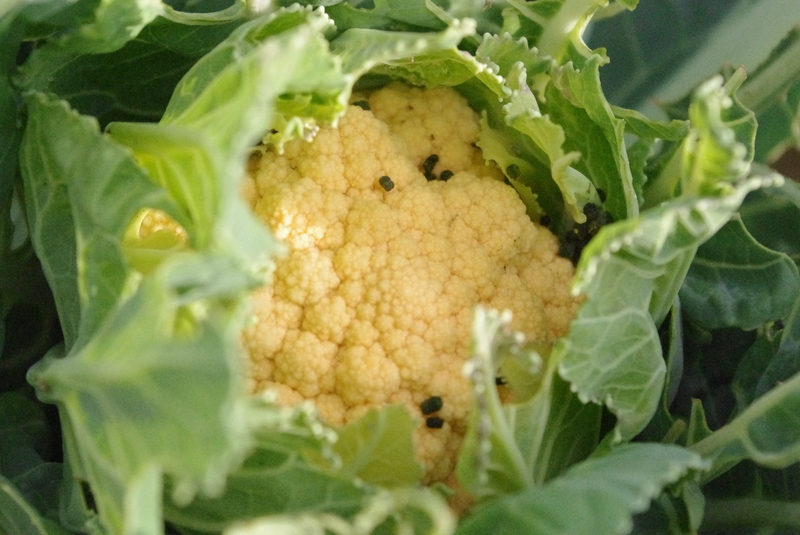 As luck would have it, Greensgrow had just sprouted cauliflower sets and POD snapped up a bunch of them before the loopers that live on the farm could infest them. Pots scrubbed, fresh dirt acquired, plants planted. Now, nearly three months later, loopers are happy campers and aphids are sucking away. 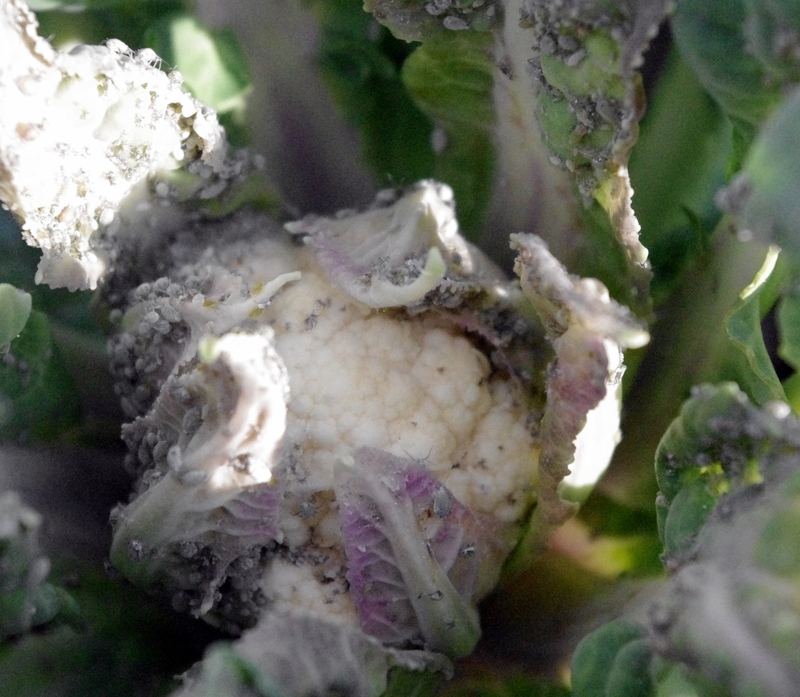 Here’s hoping our gardening by neglect yields a couple heads of cauliflower…yup, that’s looper poop. Organic fertilizing at its finest. Really, there’s a lot more on the little blue deck than was hoped for. On the other hand, hauling gallons of water up the sladder isn’t a recipe for fun or for safety, but somehow that gorgeous baby maple became a gigantic maple tree. 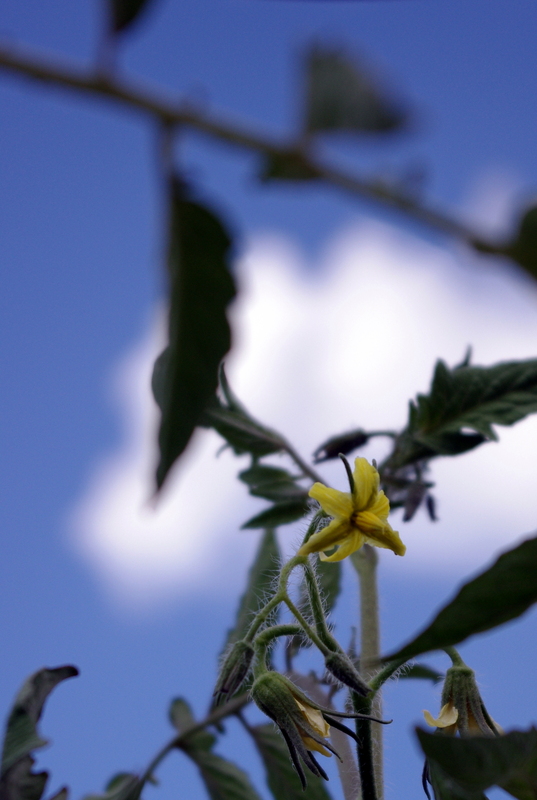 Which is nice and all, really nice, but the hours of midday shade probably aren’t so great for tomatoes and cucumbers. (Although come late July and August, Tree’s shade may provide said tomatoes and cucumbers a welcome respite from the heat.) 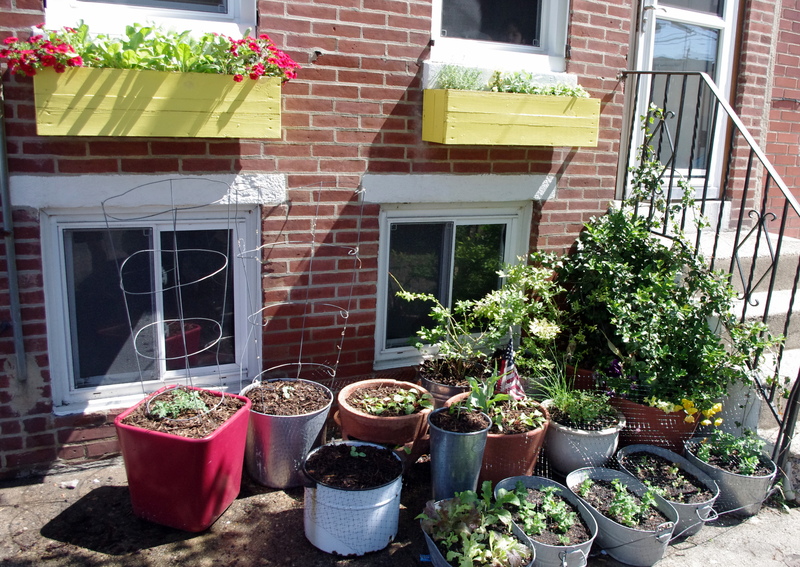 So instead of a crazy, low-maintenance, street-side Pennsport garden jungle, as this gardener had imagined, containers have been steadily migrating back to the deck. Everything has germinated, though, and once a few pollinator-attracting flowers have been added, we wait, water, and see. 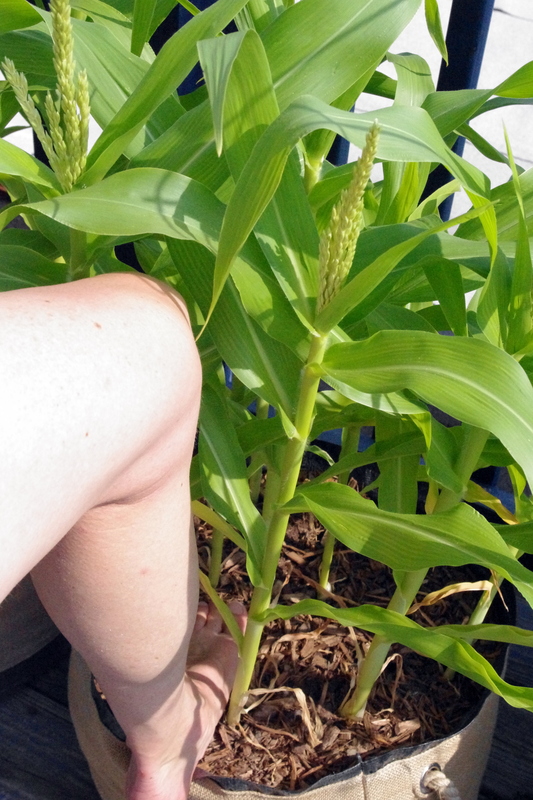 Watching field corn grow is one of summer’s true. pleasures. Eating garden-fresh sweet corn is another. 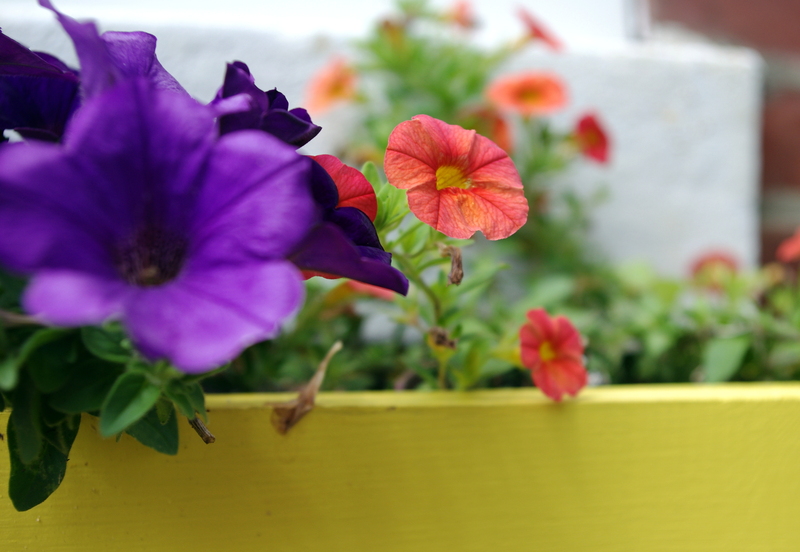 But Plants On Deck is a container garden and even we’re not that crazy. Until now. Thanks to the mad scientists at Burpee, there’s reason to hope. 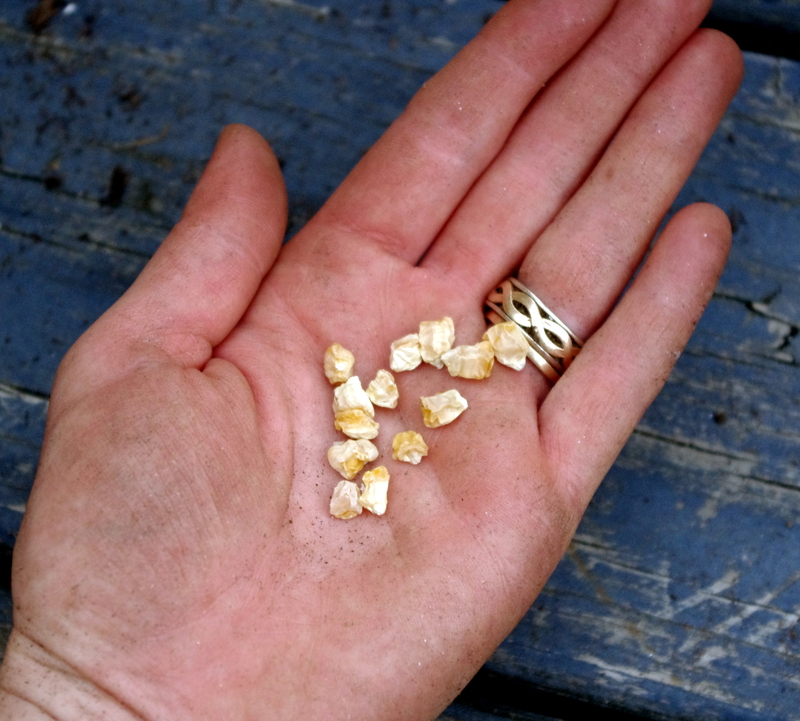 Supposedly these little seeds will produce 4-5′ stalks — on which one can expect “two to three delicious 7-8″ long ears per stalk.” Pop nine seeds in a 24″ container, wait two months and see. The On Deck hybrid from Burpee seems too good to be true (and the one review posted on the site is not terribly encouraging), but that’s not going to stop your trusty POD gardeners. Stay tuned. 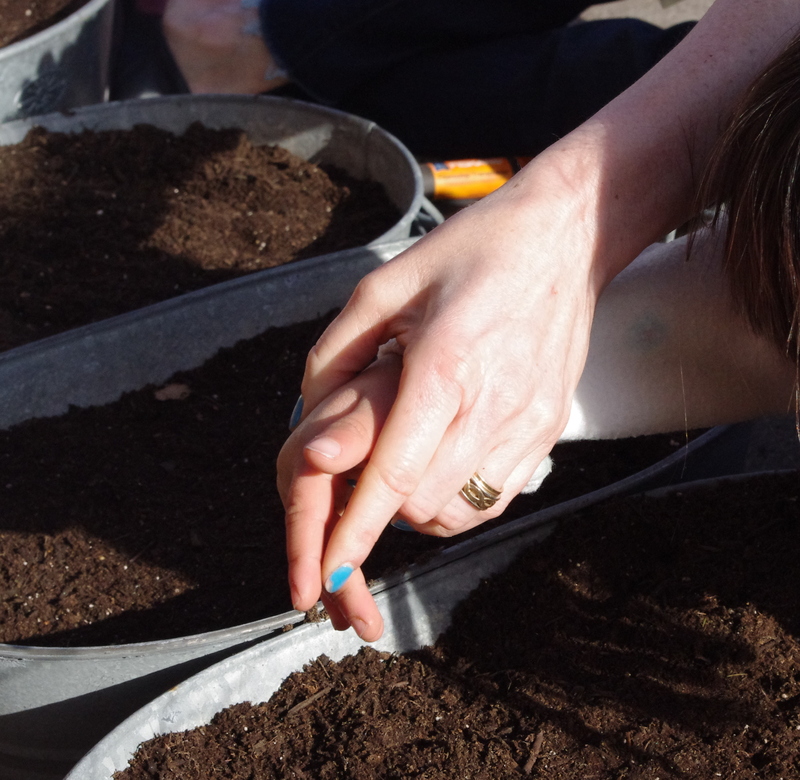 Here at Plants On Deck, there’s often a lag between garden-related activity and garden-related post. That lag is usually a day or two (or a week or so), at most. In this case, um, exactly a month has passed. But hey, it’s been cold. And life happens. But you haven’t missed much, honest. The Peas ‘n a Pot, Rhubarb Swiss chard (POD decided to go with red as an accent color this year and tends to have better luck with red chard over white, anyway), and lettuce that are shown here have only just sprung and the radishes will be ready for plucking any day. Cucumbers, oh, cucumbers. How we love thee. 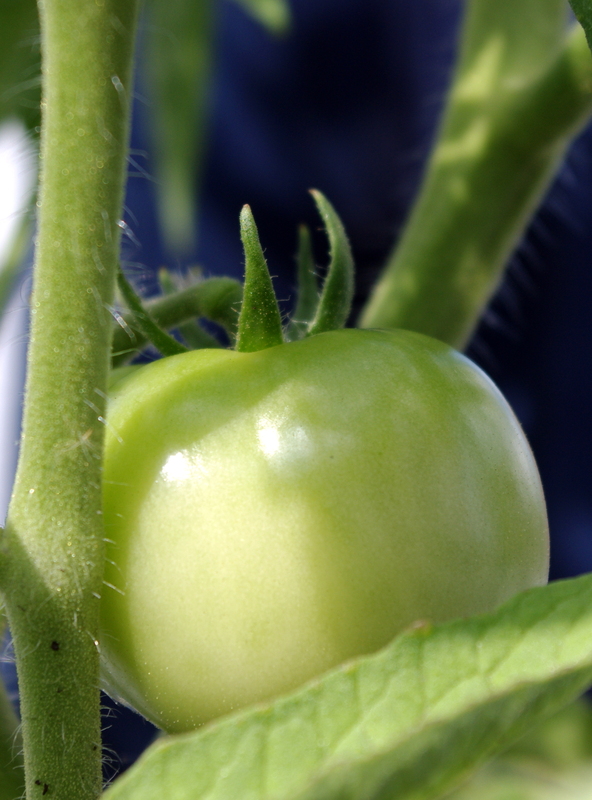 Speedy Green Hybrid: Maybe a few cukes can be harvested in 42 days? Say, before the aphids attack? This is a biggie (12 x 60), so one per pot. Supremo Hybrid: A little less huge, but still big (15 x 36). Prolific and disease resistant, thankyouverymuch. 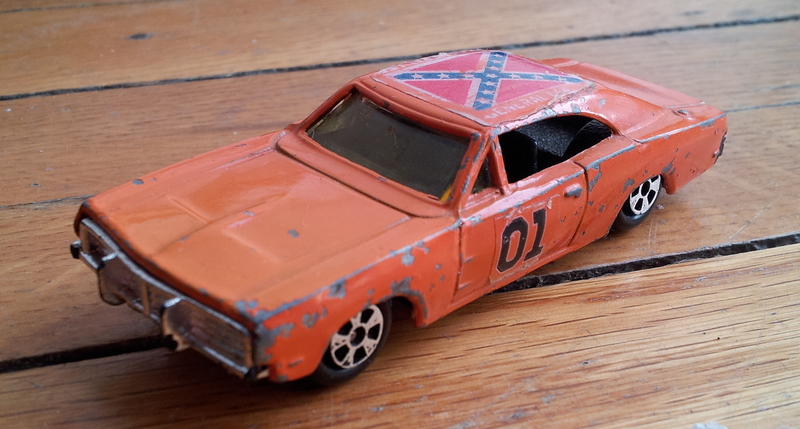 General Lee: Yup, POD’s Minder is of the Dukes of Hazzard generation. Yup, Bo and Luke? Crushable. The Charger? Still wouldn’t kick it out of my garage (if I had one) for leaking oil (a paint job, perhaps, yes). A disease-resistant cucumber named the General Lee? Yup. Sold. Thanks, Organic Gardening, for pointing this gynoecious paradox out! Honey Bun Hybrid: “Honey Bun is a real bush cantaloupe that is well suited for the smaller garden. The little melons are 5″ across with deep orange flesh and honey-sweet flavor. 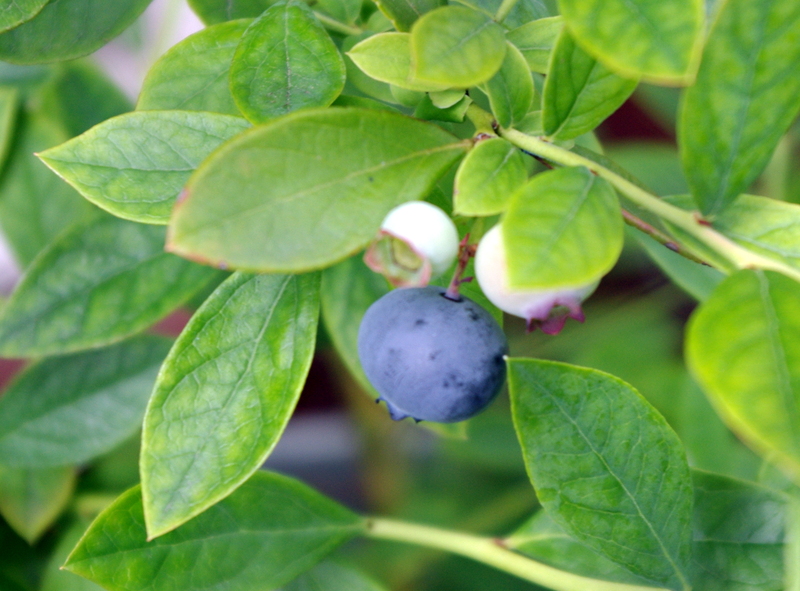 Each vine will produce 3 or 4 fruits.” That just about covers it. March happens. And for years and years it appears, Plants On Deck feels the urge to buy everything this time each year. 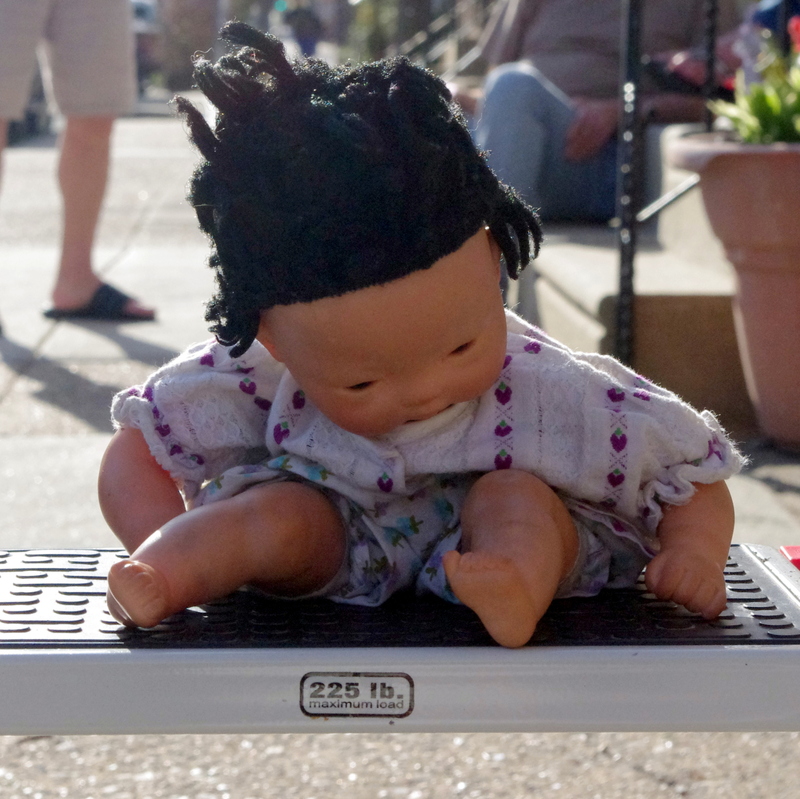 Then, weeks and sometimes months later, when the precious cargo arrives, the reasons behind the carefully-researched purchases have been long forgotten. So this year, we’re writing it down. Bit by bit. It’s an all-new crew, so there’s lots to remember. And hey, that was the original point of this here note-to-self blog. Corn: Yes, corn. Like, on the cob. In a pot. So. Excited. POD’s managed to do okay with veggies, considering the space limitations imposed by a 10 x 10 mixed-sun (too much, then too little) deck and a 8 x 4 sun-struck expanse of concrete and exhaust. There’s this smell, though, that only a nice row of fresh corn stalks can deliver. It’s the smell of my mother’s garden. And, as she reminded me this morning, my grandfather’s garden. On Deck: Okay, so the name also spoke to POD. 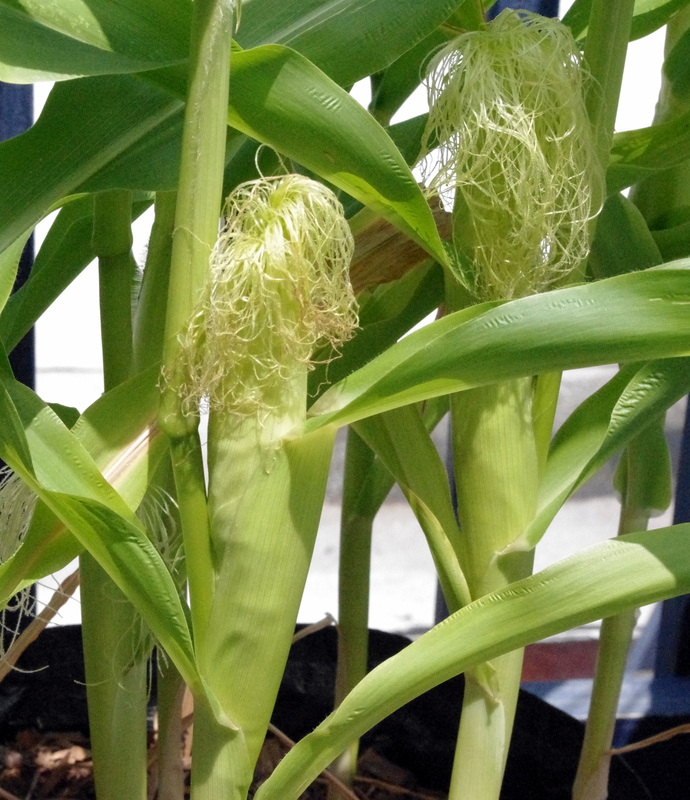 But get this, the 4-5′ tall stalks can produce two to three 7-8″ ears. 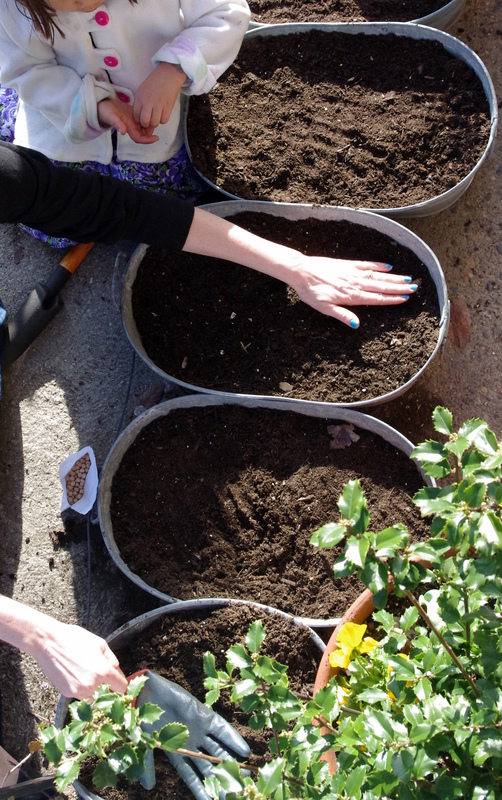 9 seeds per 24″ container. (Soil temp at least 55 degrees.) Breathe deep. Peppers: Peppers are well-like at POD, but we’ve never planted all that many or paid that much attention to them. Now that we’ve given up on green beans (sigh), there’s an extra container begging for some color. Sweet Cherry: see above, but red. Yup, up from the grave she arose. This brave, and now tardy, Early Girl managed to survive early planting (the poor dear was delivered in early April — way too early in POD’s experience to be planting tomatoes in Philly), crap soil (which, after a full refund was augmented with a good deal of organic fertilizer), and Hitchcockian bird attacks. You’re looking at the one, and only, plant on deck. Sheer laziness (and good deep-soil planting technique, thank you very much) was its savior, as this gardener was far too despondent about the prospect of the total failure of Plants on Deck to bother removing it. 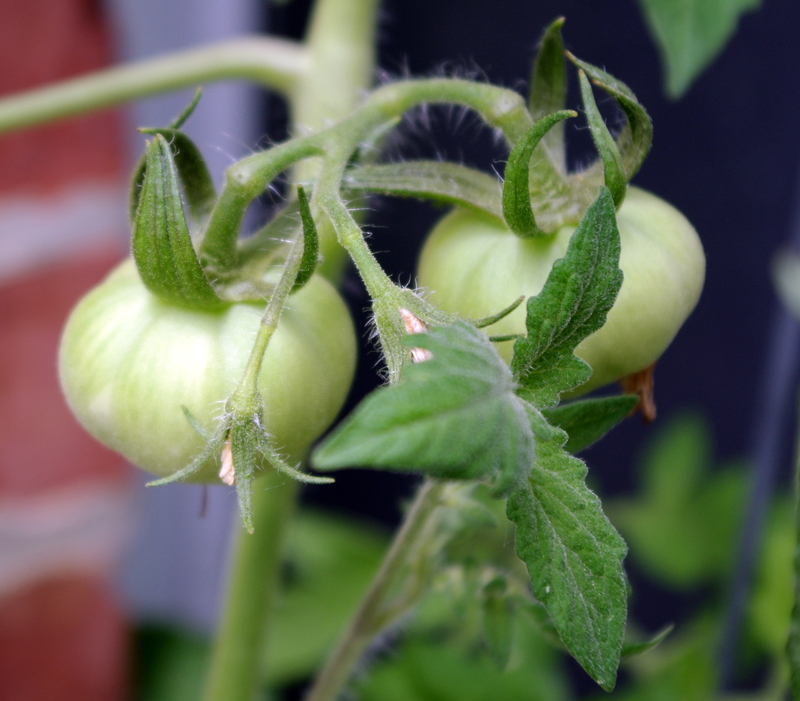 And it’s a good thing, too, as the three sizable and just ripening tomatoes out front were stolen away in the dark of night by one of South Philly’s charming pedestrians. 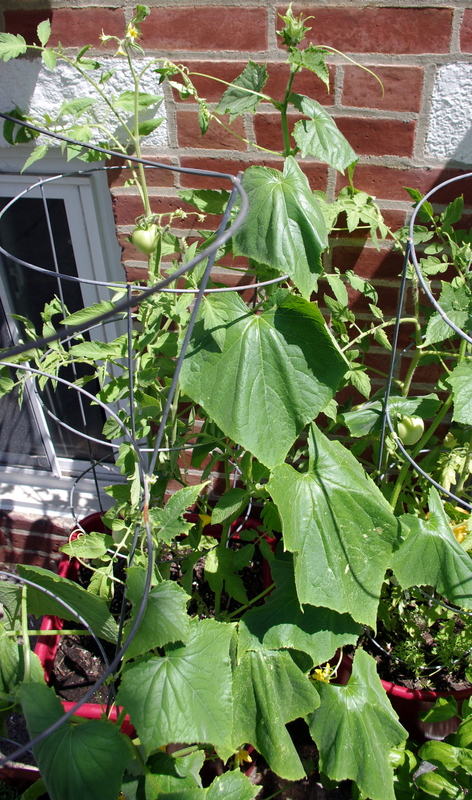 Like kudzu, this cucumber decided the Mystery Tomato’s and the Early Girl’s cages looked more welcoming. After spending about a half an hour unwinding tendrils in 90+ degree heat and carefully applying water to the soil, everyone seems happy. Except the Endurer, who’s actually doing something useful, like cleaning, entertaining a newly-minted 3-year-old, cooking, and shopping. While it’s a sad year for plants on deck, the plants out front are doing just fine, thank you very much. 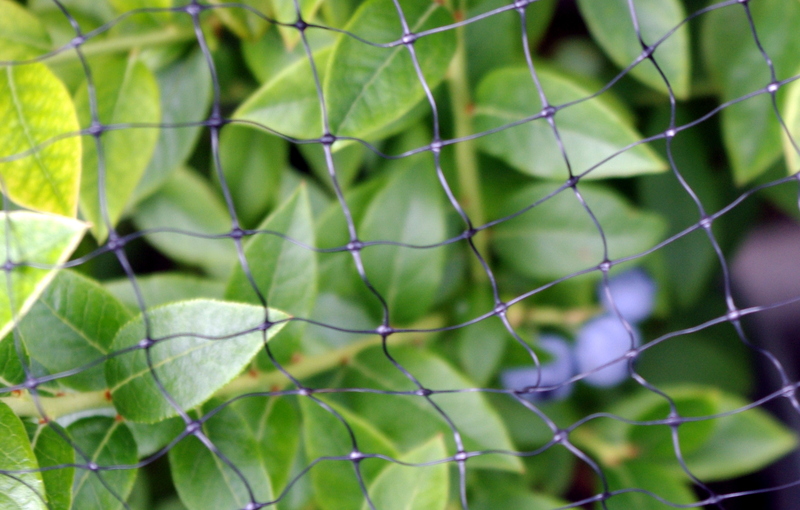 A little scrap of bird/deer netting is keeping killer sparrows at bay, leaving the possibility of a cupful of blueberries intact. Water access is much, much more convenient at street-level, and Tree — so creative around here, with the naming of things — the gorgeous, gigantic, disturbingly fast-growing white maple, provides just enough shade during the heat of the day that the tomatoes and window boxes appear to get a respite from the searing, brutal midday rays and a good dose of photosynthesizing, pleasant morning and afternoon rays. What’s this you say? POD’s…happy? Whaaaat? Has this blog been taken over by an optimist? Horrors. Surely something’s just a shot away.